Imagine the bright citrus punch of Limoncello in a classic Dry Gin. Biggar and Leith is a revitalization of an 18th century spirits business founded by the great-great-great-grandfather of the current owner — a Mr. Thomas Gladstone — in Edinburgh. The current iteration of Biggar and Leith is based in New York where they manage their small portfolio of adult beverages which are produced locally and mixed and aged under contract with distilleries in Cognac, France; Turin, Italy; and other regional producers. The area around Torino (Turin) Italy is famous for their specialty liqueurs. Carpano, Cinzano, and Martini & Rossi are all based nearby. So is Torino Distillati — a family-owned producer of very high-quality spirits for generations and where Malfi Gin con Limone is made. The location is perfect since they wanted to use Italian lemon as the fruit-forward component of their new Gin. The name comes from the famous “Amalfi Coast” region of southern Italy and Sicily where they grow some of the best citrus in the world. The rest of the ingredients include juniper (of course) and five other botanicals — including coriander, angelica root, and cassia bark. The Dutch and English would debate the point — well, they might actually get pretty angry about it — but Gin was invented in Italy during the 11th century when cloistered monks added Italian Ginepro (juniper) to their distillation. Dutch Genever came about 200 years later. Let the fighting begin. 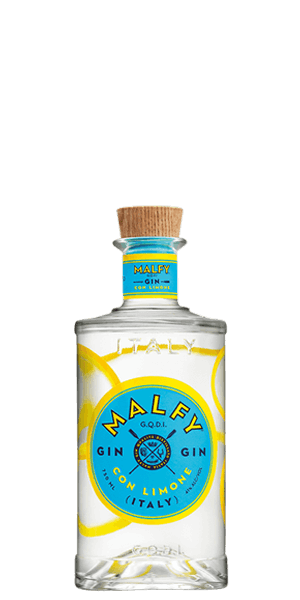 What does Malfy Gin Con Limone taste like? The Flavor Spiral™ shows the most common flavors that you'll taste in Malfy Gin Con Limone and gives you a chance to have a taste of it before actually tasting it. Perfect for a gin and tonic garnished with Meyer lemon and rosemary! This is a perfect gin for a martini with a twist of lemon. It is very refreshing for a summer cocktail. First tasted this in a bottle shop in Cambridge, England on a rather rainy day, and the cheery Italian lemon notes hit the spot. So a bottle came home. Over time, I've found it makes a good martini and also plays nicely in a 50-50 G&T with extra lemon zest. While the lemon is a welcome change from the typical juniper-forward dry gins, it's a "good" not "great" bottle for me. Has a pleasant citrus flavor and goes great with tonic. A nice break from typical dry gins, would highly recommend! Pure lemon bliss. Excellent with tonic. This is now my favorite gin. If you're looking for an intense juniper experience, look elsewhere. I, personally, only like a strong hint of juniper, and this drink hits that mark perfectly. This is a GREAT sipping gin, and makes a perfect G+T with nothing but tonic and Malfy. If you're not a fan of citrus or looking for serious juniper flavor, you'll likely be disappointed. great lemony gin. wonderful in the summer. 1st class gin! A subtle reminder of the Mediterranean, citrus lemon flavoured, but not too overpowering. Very refreshing and tasty!! Top marks! !